I did it. I finally started reading Outlander, after months of procrastinating because I was so intimidated by the size and hype of this book. And I finally finished it now too, after two weeks of reading. Man, this was one big book. But still, I’m happy I finally took the plunge, because this story is definitely worth the read. Now, while I did really enjoy the book and would like to read the second book in the series as well, I have to be honest and admit I did not like it as much as I thought I would. And the problem is I can’t really pinpoint why that is. Perhaps the hype was just too big. Perhaps the book was just too long. Perhaps I forced myself to read and finish it a bit too much. Perhaps that one scene with Claire’s punishment just rubbed me the wrong way and I had a hard time forgiving that. Most likely it was a combination of all of the above. First of all, there’s the extensive worldbuilding and attention to historic details. I went into this book knowing absolutely nothing about Scotland and Highlander clans in 1743, but it was a thrill to learn more about it all. Is it all historically accurate? I assume most of it is, but I honestly don’t know. What I do know is that you will become completely immersed in this world while reading this book. And because you can look at this brutal world through Claire’s eyes, we get a modern-day (well, 1945-ish modern-day anyway) view of this world, which only intensifies the experience. Talking about Claire, she is quite the amazing protagonist. I loved her from the very beginning and I only grew to love her more while reading. She’s smart, practical, sassy and funny. I’m not sure many women would be able to stand their ground when thrown in the middle of raging Highlander clans, but she does and she does it in style, while still being a believable modern day woman who questions the barbaric ways of the past. I loved her loyalty and her cunning. I loved that she never really forgot about her husband. I loved how well she adjusted. Then there’s Jamie. He’s got quite a lot of rabid fangirls behind him and I now understand why. He’s a complex character, with both good and bad traits to him, which makes him real and relatable. He does some things in this book which did make me cringe a bit and took me a while to forgive, but in the end he’s just such a good, kind-hearted, noble and passionate person that you can’t help but root for him and eventually fall head over heels in love with him. 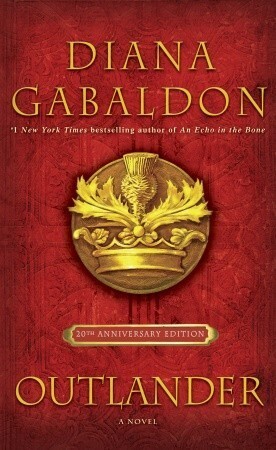 The romance between Claire and Jamie is the heart of this story, even though the morality of it all is up for debate. But the good thing is that this question of morality is never ignored in the book either. Claire herself wonders about it often. My view of it evolved throughout the story as I assume it was supposed to. At first I was steadily against any romance and rooted for Claire to return to her husband as soon as possible. But as the story progressed I saw the heart of it all and realised things were not so simple anymore. Finally, I loved the secondary characters. Trying to figure them out was a blast and in some cases I’m still not sure that I did. I LOVED the character of Geillis Duncan. She was so mysterious and intriguing and I wish we could have gotten more of her. The characters of Colum and Dougal MacKenzie were equally difficult to figure out, but I did love all scenes where we got a glimse into their lives. And then there’s Murtagh and Jenny and Ian and so many other wonderful characters. Have you read Outlander? What did you think ABOUT IT? I don’t think this is one I could ever read (although I do love the historical Scottish aspect), but I’m glad to hear you enjoyed it! I wasn’t able to get into the show either, haha. It’s so good reading something that’s been on your TBR for ages though! It always makes me feel really accomplished!